The legendary Roland, knight-errant of Charlemagne’s time, rode a horse, carried an indestructible sword and battled giants. As well, he made himself heard by using an unbreakable horn. A horn is something our Roland does not need. He has made himself heard in Castlemaine through the work he does at the Mount Alexander Community Information Centre, his bike serves him better than a horse, and the hills he rides each day can be just as daunting as any medieval giant. He bought his place on Lookout Ridge Road on March 11 1995, and considers it one of the best things he ever did in his life, and he’s lived there permanently for the last 13 years. When he first saw it he said, “that’s it”, and it is. Roland Moswick protester and pacifist came from a German Polish background. He lived at first in Sydney but left there in 1972 to avoid both conscription to Vietnam, and possible penalties for his rebellious role during the South African Springbok Rugby Team Tour. In Melbourne he lived for a time in Albert Park within sight of Station Pier and daily he could see the very spot where his family had disembarked from Europe to begin their life in Australia. This sometimes led him to feel a bit like a displaced person who viewed Melbourne as a kind of Labour Camp. He worked at a variety of jobs in the City, but continued to yearn for a simpler life, such as he had encountered on his travels. Even though he bought his house in 1995, he was for a while, just a weekender. Two events however brought about a change. One was the catastrophe of September 11, 2001, in the U.S. and the other was the news that he was about to become a parent. The prospect of Australia becoming involved in yet another war and the thought of raising a child in the city were enough to motivate him to make a move. How far could one go under the circumstances? The Chewton Bushlands seemed far enough. 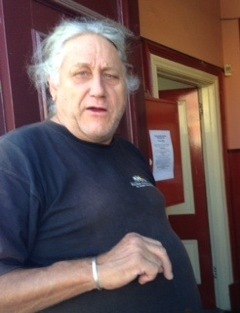 After relocating to this area he was employed by IGA in Castlemaine and worked there for several years doing various jobs including Product Manager. But he was always filled with a desire for change and voluntarily he disengaged from the mainstream economy and swore that he’d ‘never work for a capitalist again’. Since making that decision he has been a volunteer for the Mount Alexander Shire, working in the field of Community Services. 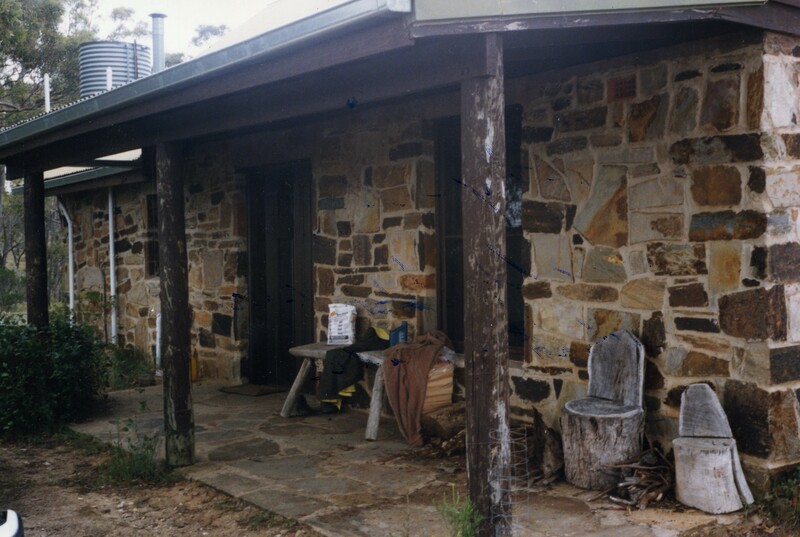 When he lived in Melbourne he had become familiar with this area through friends who had settled just south of the Bushlands. In 1995 whilst looking for what was Ray Lindstrom’s property, which was up for sale, he saw another ‘for sale’ sign at Lot 39, Lookout Ridge Road. And so at that moment a new chapter in Roland’s life began. In earlier travels Roland had spent time in both India and Nepal. On these adventures he realized that to live a fulfilled life one doesn’t necessarily need very much. Some of his happiest moments were spent trekking through the mountains of Nepal where one could travel for days in the peace and quiet and rarely encounter any sign of modernity. When he saw the house on Lot 39 he was reminded of those moments, and as he looked about at the surrounding scenery with Mount Alexander in the distance he could almost imagine it covered with snow, and the house and its accompanying tree as a Nepalese abode. The tree even had a plinth at its base much as is seen in Nepal, placed that way in order for the porters to take rest with their burden balanced behind them. Then when he went inside the house what was there not to like about its spiral staircase, stone walls, and efficient utility area? It took only a matter of days of negotiation and the house became his. The house itself is one of the houses built by Brian Parsons and his team of workers. We don’t know if Brian had ever been to Nepal but it seems likely that when building a house that is constructed primarily of the materials that are immediately at hand there is a naturalness about the final product that lends itself to its environment in a way not found when using other means. As you can see from the plan it’s made of stone. 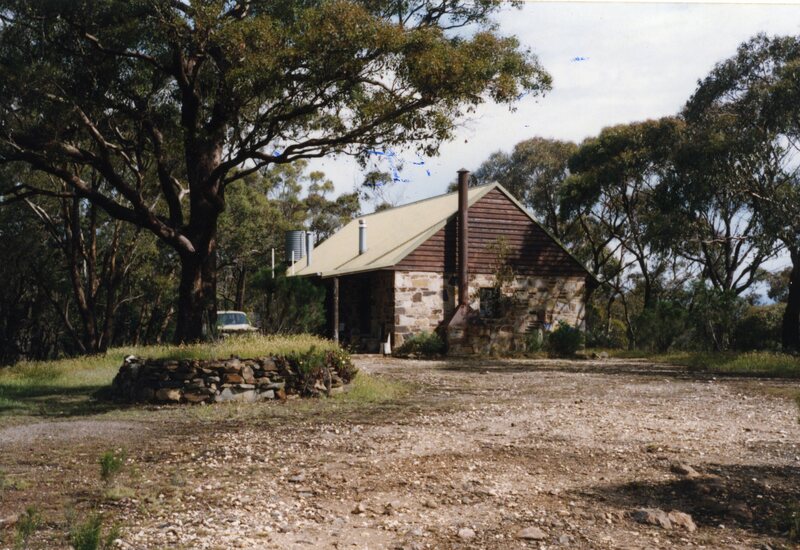 The house is set on a 15cm solid concrete base and is approximately 7 x 10 metres in size. The 35cm thick walls are built of local stone and slate and the hardwood beams support a sloping galvanized iron roof. Inside, like each of the Parsons houses, it was originally fitted with a gas stove, gas hot water service, stainless steel sink, approved septic system, shower recess and a potbelly stove. Click here to open the Lot 39 Plan, at right, as a PDF in a separate window. Access to the second floor is via a custom built spiral staircase. Roland has since made a series of improvements and upgrades including the creation of walls and paving on the exterior. Like many of us who live in the Bushlands Roland is fond of the solitude to be found here, it’s wildlife and its rugged natural quality. He pumps his water up by hand because he enjoys doing it, just as he also enjoys collecting and chopping his own wood, and riding the roads on his bike. Originally he wanted to buy all three of the surrounding Lots and close off all but the entrance to his own place but the cost of doing so was too much, and then when John Richardson came and built on Lot 40, he quickly became used to having a neighbour. John also arrived with another idea: the possibility of connecting to the electricity grid. This would have been impossible on his own but with John paying his third and a connection to Lot 38 also being part of the deal, it became manageable. 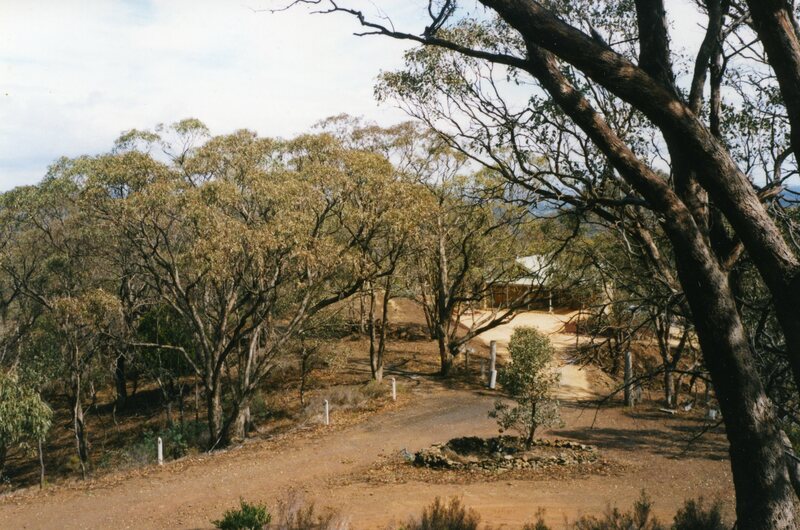 These are the only properties in the Bushlands on mains power. 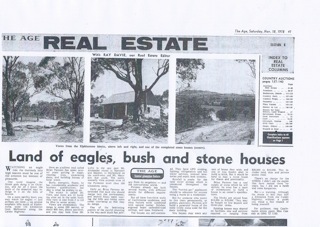 For a brief time this part of the Chewton Bushlands was advertised as Mountview Estate and a picture of Roland’s house was used in the advertisement at Cassidy’s office in Castlemaine and in The Age Real Estate article of Nov. 18 1978. At that time you could have all this for $12,000 to $15,000 for an empty block or for one with a stone house the cost was between $38,000 to $42,000. 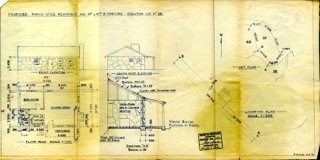 As well as Lot 39 there were Parsons built houses on Lot 27 and Lot 29. 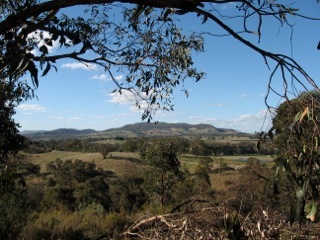 Reference has also been made to the sighting of eagles from this spot and to the possibility of an aboriginal presence. Today eagles, hawks and falcons are a regular annual sight in the spring, summer and early autumn, soaring overhead during the breeding and nesting season, then perching on the tall timbers nearby. 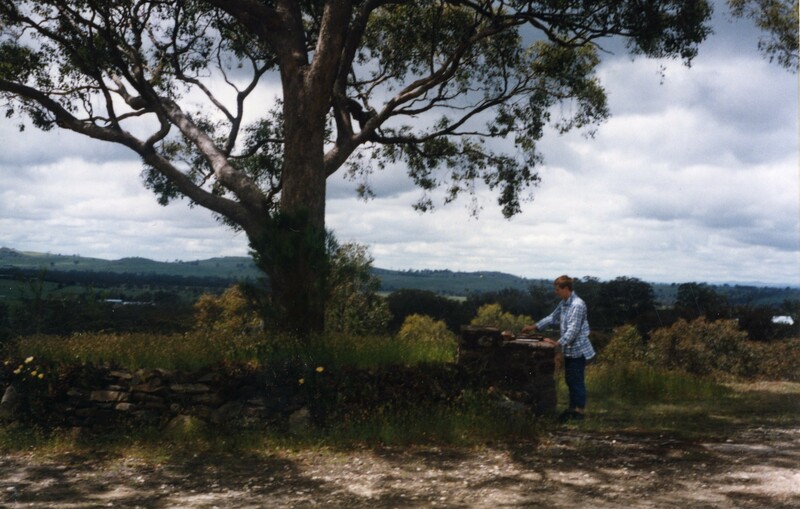 As to whether the red box tree in front of the house was actually carved by a native hand we are not certain, but what is beyond doubt are the small -found stone tools and the likelihood that this place has been used as a viewing platform of the surrounding countryside since long before our time. This entry was posted	on Wednesday, March 19th, 2014 at 10:04 am	and filed under • Bushlanders, Our lot. You can follow any responses to this entry through the RSS 2.0 feed. I’m really enjoying reading these historical snippets. Who wrote this one? Well done to all involved.